Finished ten test subjects. The lighting in the photos doesn't do them justice, unfortunately. I was going to leave the eyes dark, but thought they needed something to contrast with the rest of the dark color scheme. Again, going back to Mr. Saturday's minis, I liked the glowing eyes, so swiped that idea, but I wanted a fiery look to mine. Minis are built from Mantic zombie & ghoul bits. 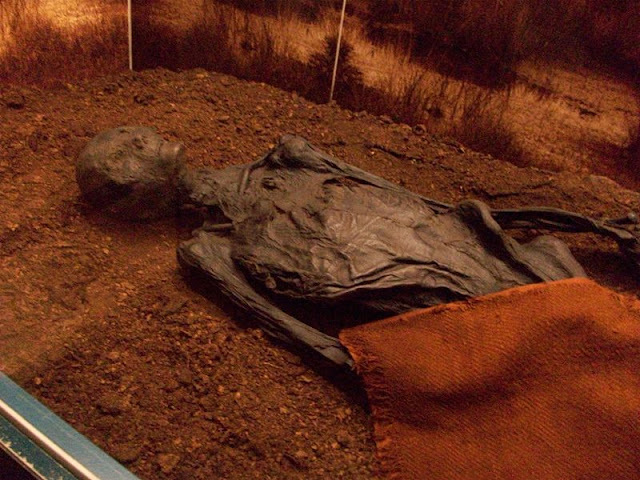 The inspiration comes from the real world bog bodies (pic By Commander-pirx at de.wikipedia - Own work, CC BY-SA 3.0, https://commons.wikimedia.org/w/index.php?curid=11778254). Some of the bodies that have been recovered are suspected of being disposed of intentionally, for a variety of proposed reasons. At any rate, back to my Fomorians... I will present the background in a better format later, but the gist is to twist the GW Fimir story a bit and not really related (as far as I can tell) to the mythological Fomorians. The/my Fomorians are ancient, and slow to reproduce. This is due, in part, to the fact that they multiply through ritual sacrifice and primal magics of the elements of earth and water, flesh and blood... More stolen ideas, partially from the background for the goblins in Crucible. Essentially they make a sacrifice, toss it into the bog, and hope that when they come back in a few days the body & spirit have transformed into a new Fomorian. The magic is as unreliable as it is ancient. Failed sacrifices are not a complete loss, however. Many Dirach & Meargh are able to animate (more on that later) these failed sacrifices in times of need, which have been ritually disposed of in the bogs around the Fomirian settlements. In terms of gaming & rules... without getting into the details, my ideas are sort of undeady, but closer to what are usually classified as ghouls rather than zombies. But not really either of those. Ghouls are going to be my starting point in terms of most gaming rules, though. Got to say, I like where your going with this, keep up the good work. Anyway, they look great and this is coming from someone who doesn't really like most Mantic models. The floorig eye effect really draws attention to their face from the mutedness of the color scheme. Thanks. Mr.Saturday beat us both to the bunch. As far as Mantic models, I think these are still among their best. Some of the other undead are decent, too. The glowing eyes are gorgeous. Combined with the bogginess, they make these guys really jump out. Thank you. I think the dark colors, in contrast to the pale Fomorians/Fimir, will also stand out. Interesting take on the bog sacrifices and why not. Cool models by the way especially the eyes.